Will a $75 Million Head Tax Be Enough? The task force will push for more than just a tax on big businesses this year. The task force Seattle council members created to review a plan for a head tax has raised the stakes. 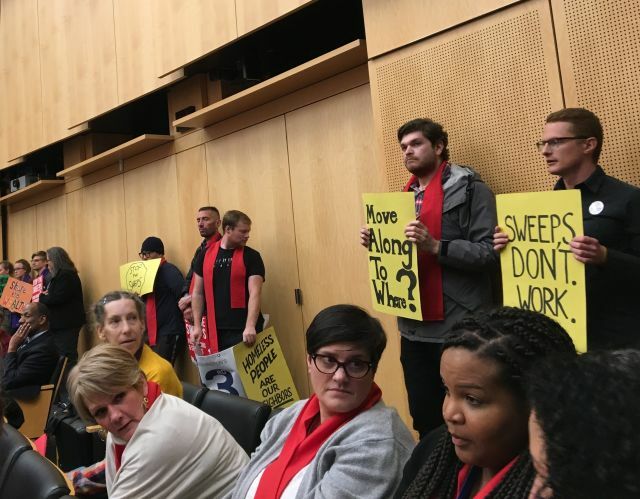 Back in November, the Seattle City Council couldn't support a tax on big businesses that would've raised about $25 million for homelessness services. Instead, council members promised to create a task force dedicated to finding progressive revenues and to revisit the head tax (also known as an employee hours tax) again at a council meeting in March. Well, the task force members convened for a final time—and their proposal to the council this time recommends a $75 million head tax (three times more than what Kirsten Harris-Talley and Mike O'Brien proposed earlier). Council member Lorena González, who co-chairs the task force, said she expects the legislation to be ready for a vote by early May. They'll discuss the tax on Wednesday in Sally Bagshaw's finance committee. Members said during their last meeting that $75 million was not the end goal—they want $150 million a year. The tax was still a compromise, far less than what many of their community members had wanted. The Housing for All Coalition and council member Kshama Sawant will push for a $150 million head tax, and council member Lisa Herbold still wants the city to use its bonding capacity to leverage more money. Council members in November promised to support an employee hours tax in the future. A month later, Congress approved a federal tax bill that provided corporations a 40 percent tax cut. The task force's proposal quoted Steve Walker, Seattle's Office of Housing director, in a Reuters story saying he expects that to mean a 14 percent reduction in the city's creation of affordable housing. Lisa Daugaard, director of the Public Defender Association and a member of the task force, said during a meeting that the members have been "doing some really hard and heavy lifts in their own communities" to support the $75 million tax, which many still think is not enough. "I believe that they are doing it to get to the mark to have a real impact," Daugaard said. "I don’t think we should send them back to their communities as ambassadors for this work and then have it turn out that there’s only political support for something far less than $75 million." All this to say—it'll be a hard sell to oppose the tax when it comes to the council. And it wouldn't be much of a leap to expect council members to eye other strategies beyond that shortly after. "I think this is a down payment in terms of the larger picture that we need to be investing in," council member Teresa Mosqueda told PubliCola, after saying she supports the proposal. The overwhelming success of lobbying for the tax is a stark contrast to what the council looked like just a few years earlier; far-left council members have been pushing for a tax on big businesses for years and never mustered enough support. What's changed? Unlike the earlier proposal, the task force's recommendations didn't iron out details, like how much the tax would be charging businesses—either per employee, per hour, or a percentage of their payrolls. Rather, they focused more on broad policy goals and principles, like dedicating the revenue first and foremost to housing and making sure the tax is as progressive as possible. It also tries to address criticisms that small businesses who might have large gross revenues (but not large profits) would be disproportionately impacted. The recommendations include a payment for small businesses—what the task force called a "skin in the game" fee—suggesting an annual fee like $200 a year. Employers can reduce their tax based on their business-and-occupation tax exemption. Any title six businesses (those that can't deduct business costs from federal income tax) are also exempt.